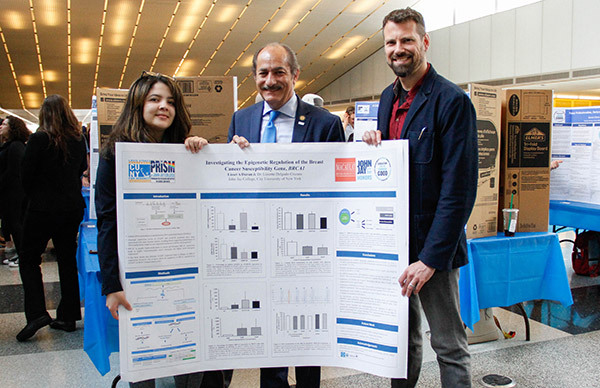 This spring, John Jay students presented original research and projects to fellow students, faculty, and the general public as part of the annual Research and Creativity Week. From April 30 to May 4, 355 undergraduate and graduate students from 25 areas of study participated. Presenters included students in the Honors Program, the Program for Research Initiatives in Science and Math (PRISM), Macaulay Honors College, the McNair Scholars Program, and Student Academic Success Programs (SASP), as well as students completing their capstone courses in the Criminal Justice and International Criminal Justice majors. Also included were the departments of Public Management, Psychology, and English. A total of 163 faculty members served as mentors for student projects. Bettina Muenster, Assistant Director of the Office for Student Research & Creativity, helps organize Research and Creativity Week. As always, she was impressed by the students who participated. “This year’s Research & Creativity Week has once again been an enormous success and demonstrated the indisputable power of intense student-faculty research collaborations,” said Muenster. This year’s projects were diverse in topic and form. 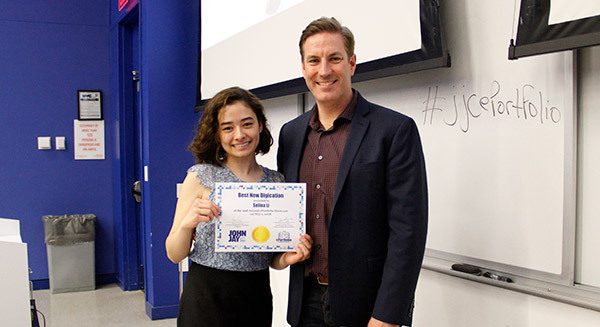 While Karen Argueta presented a storytelling podcast she helps produce at John Jay, Joseph Mahmud presented an app that he and students Steven Pacheco and Donauta Watson-Starcevic created to help formerly incarcerated individuals find jobs. For their innovative app, Mahmud and his team were recently named the winners of the Echoing Green Social Impact Challenge. 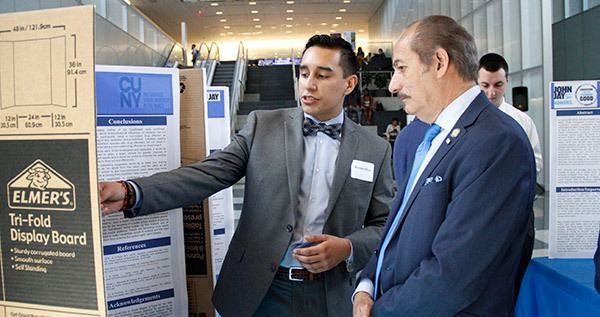 On May 3, Dr. Guillermo Linares, Acting President of the New York State Higher Education Services Corporation, visited the Honors Program poster session. 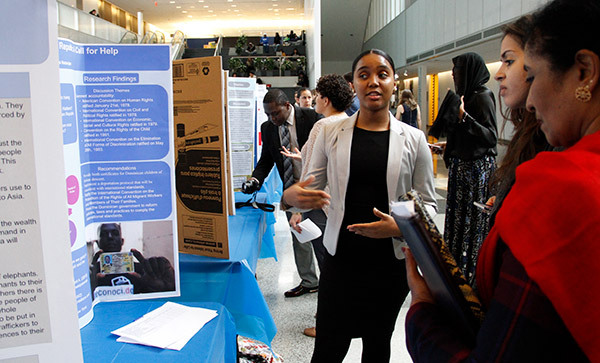 The posted session showcased Honors students’ scholarship and creativity across various disciplines. 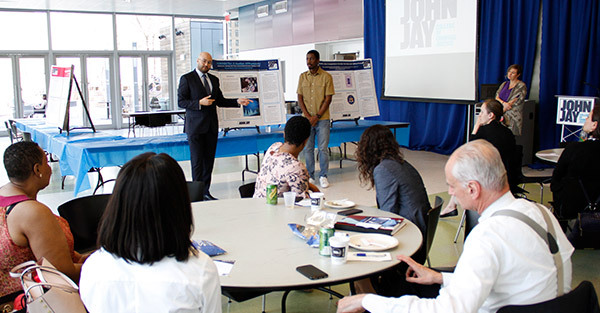 Dr. Linares, who oversees financial aid for higher education in New York State, was able to witness some of the unique and remarkable research conducted by John Jay students. PRISM students also showcased their research presentations in forensic science, toxicology, cell and molecular biology, chemistry, environmental science, and computer science. Lisset Duran, who has conducted award-winning research on the genetics of breast cancer and who will be attending Princeton as a Ph.D. candidate this fall, presented her findings at the PRISM symposium as this year’s Outstanding Undergraduate Researcher. On May 4, to conclude the weeklong fair, students were given awards for top ePortfolios. EPortfolios are student digital archives that document learning and spotlight achievements in and out of the classroom. You can view the list of award-winning portfolios here. View more photos from Research and Creativity Week.